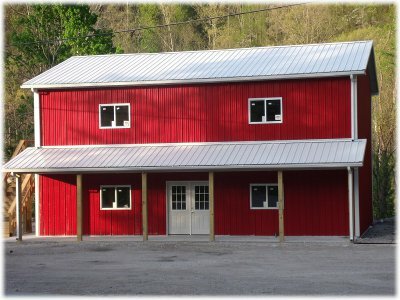 APB engineers homes and barns with living quarters for ultimate functionality. This two story home is an efficient and flexible option allowing a clear span first floor. For various styles of buildings sold see our pole barn kits page. This design features floor trusses on the second floor which means that interior walls on the first floor can be present or not, ideal for that 30' wide living room. Our structures are designed with energy heel trusses. These trusses have 9" heels to provide sufficient height from eave to eave for blown insulation in your ceiling. Another feature we recommend is the use of sheathing on the roof to reduce noise from rainfall on the second floor. Want to add a nice look? You can incorporate scissor trusses in the building design to achieve a cathedral ceiling. Option available for 2x8 girts bookshelfed (fit between the posts flat), with 1 1/2" of the girt protruding out past the post to align with the truss supports and grade board below. This makes framing a snap and provides a deep cavity to fill with insulation and still achieve an air gap between the siding and insulation. We sell the building shell and various structural components like second floor truss or joist systems. Houses from us will include everything you need for the structure, detailed building plans, and sealed plans signed by an engineer licensed in your state. Structural plans do not include plumbing, electrical, or interior walls.